I have decided to start a food blog. Anyway, I have decided to start a food blog. 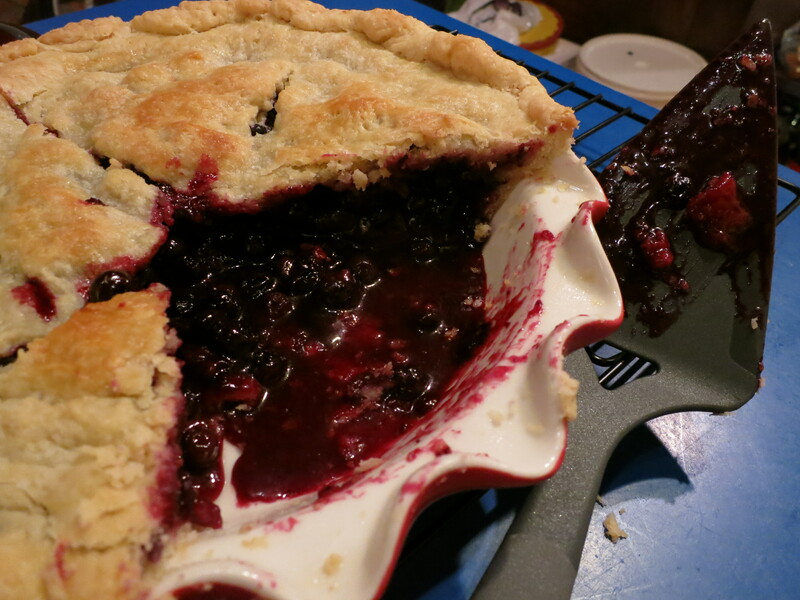 Here is a picture of pie. When informed of this development, a close friend of mine asked what my niche was going to be; why this blog is special. The short answer is: it’s not. The longer answer is that I don’t rightly know, at least not yet. It may be that as time progresses I will find myself focusing my writing upon reviews of restaurants serving elaborate fusion meals whose main ingredient is purloined backyard chickens. Or perhaps instead it will be made up of recipes for cocktails made of root vegetable juices and bathtub gin. The only way to find that out though is to start writing and see where fate leads. Let’s call it the Calvinist approach to food-blogging. For this first post, I don’t have a restaurant review or recipe to entertain you with. Instead, here are a few things that influenced my love of food—or are food-related and I just happen to love. Note, I did not say just my mother. Her cooking certainly did the most to shape my palate and my appreciation for good food. When you grow up in the middle of nowhere Ohio, you don’t have the ability to run out to the nearest ethnic or gourmet restaurant. That never mattered much to us. My mother exposed us to world cuisine and fine dining from the (very narrow) confines of our home kitchen. Not only that, but her advice was always that I better learn to cook because I love to eat well and “you can’t count on anyone else doing it for you.” I took that message and ran with it. It was five years ago that an unsolicited trial copy of Cook’s Illustrated first showed up in my mailbox. To this day, I don’t know where it came from or why. I just know that from that day forward, my perspective on recipes was forever changed. The magic of Cook’s Illustrated is that it doesn’t just tell you how to make a dish; it tells you why to make it that way. It emphasizes technique as much as ingredients. The time and attention that each and every recipe receives ensures that the end result will be amazing. Perhaps their approach is too analytical for some, and I respect that opinion. For me though, I love the fact that, as they like to say “When Cook’s Illustrated endorses a cheesecake, it’s because its editors made 45 of them.” I’m the guy who reads hundreds of reviews before making even the most basic of purchases. Cook’s Illustrated was made for people like me. Cook’s Illustrated is not my only go to source of recipes however. I am a cookbook junkie. If I only made recipes from my current collection of books, I could probably eat for a lifetime and never repeat a single recipe. That being said, every year, I’m tempted to buy the newest compilation of recipes from Cooking Light. Sometimes I resist, sometimes I don’t. I could go on. There are many things that I love about food: cast iron, sharp knives, my grill, and Alton Brown. Oh, and Skillet. But I won’t. If only because I hope this is what will be the first of many posts, and I don’t want to 1) prematurely bore my nascent audience or 2) use up all of my good material.